To our eyes, it's no looker, but the Ventura is a real tone machine that will cover just about any player's needs. Unique pickup layout. Great playability and tuning stability. Not everyone will go for the body shape. Trevor Wilkinson's Fret-King Black Label Series Ventura is a surfin' bird with a love it or loathe it body shape. It also includes Trev's Vari-coil control, which enables you to dial out a proportion of each pickup's windings to help pull single coil-like tones from those humbuckers. Let's take a closer look. 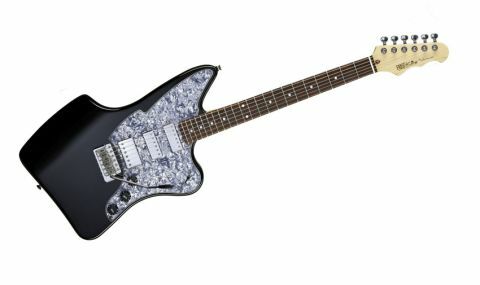 "The upper bout of its American alder body echoes the offset design of a Fender Jaguar"
The Ventura that strays pretty far from its inspiration. While the upper bout of its American alder body echoes the offset design of a Fender Jaguar, albeit with an extended top horn, the unconventional squared-off lower bout looks like it's been caught in a mangle, making the Ventura, visually at least, a bit of an acquired taste. There is plenty of good news. Playability is first class thanks to a slim-profile bolt-on maple neck, 254mm (10-inch) radius rosewood fingerboard and 22 superbly finished medium jumbo frets. The Wilkinson WVP vibrato has a reassuringly chunky baseplate, not so unlike that of a PRS, while Wilkinson's WJ05 E-Z Lok tuners keep the pitch in check. Power comes courtesy of a bridge-position Wilkinson WHHB humbucker and two Wilkinson WDG 'Focusfield' mini-humbuckers. "The Vari-coil control expands the tonal palette brilliantly"
The Ventura's powerful bridge Wilkinson WHHB humbucker is perfect for full-on rock, punk and metal stuff. Conversely, the alder body/bolt-on maple neck construction renders the middle- and neck-position Wilkinson WDG 'Focusfield' mini-humbuckers with a lighter touch than you'd expect from those installed on a Les Paul. For instance, there's very little loss in clarity when you flick the switch to the neck position. The Vari-coil control expands the tonal palette brilliantly, especially when you want to back off the heat for more clarity in your overdriven moments. It gives the bridge humbucker the opportunity to impress with a classic surf tone, too. On full power, the in-between positions are much fatter sounding than those of Fender's finest, but judicious twiddling of the Vari-coil gets you pretty close. Trevor Wilkinson doesn't so much reinvent the wheel as give it a retread, whack on some shiny rims and then make sure it handles as good as possible. It's an approach that's working. Some of the best affordable new guitars that have been through our hands in the past year or so have had the Fret-King name etched on their headstocks.